The Marie Curie Great Daffodil Appeal is an annual event that seeks to raise funds for the terminal illness charity. This year, we were tasked with launching the month once more. Now to get the background to this, we have to go back to a piece of strategic thinking that we developed with the team there to help the charity come up with a compelling platform that people might want to support by digging into their pockets and handing over some pennies. Because Marie Curie supports those living with terminal illness, we didn’t have a happy ending to support – there are no illnesses to eradicate or medical cures to find. So we helped them to come up with the real cause for the organisation – that Marie Curie supports those who are living with terminal illness so they leave a positive legacy of happy memories amongst those who they love and who love them. Because without the charity’s support those left behind are all too often left with memories of battling for hospital places, or battling to get loved ones out of those hospitals. It leaves a legacy of sadness rather than joy. And the people who enable that legacy are the Marie Curie nurses, those who bring light in the darkest hours. 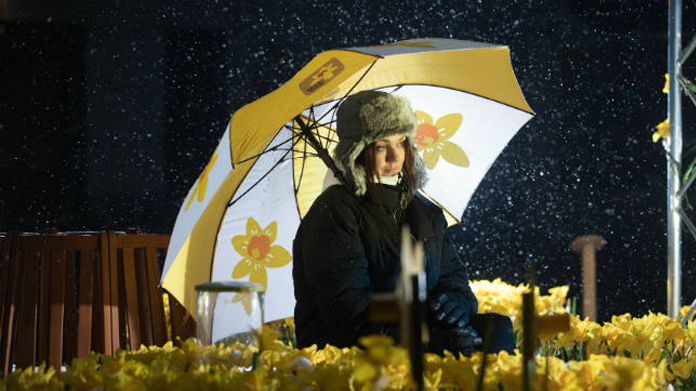 Hence, the Marie Curie Garden of Light – an installation of 4,000 daffodils, one for each person that the charity will support during the month of March alone. We worked with the nice people at public art collective Greyworld to create the stunning space which literally brought light to the London skies as the daffodils glowed strong through the night to make the platform manifest. The launch did just what we wanted with cracking coverage across the i paper, ES Magazine, METRO, (twice), the Evening Standard, Grazia, BBC London News, Hello!, Refinery29, TimeOut, (twice), Culture Whisper and a host of others. What’s more, we enlisted the support of a host of our social friends who gave up their time for free and gratis to spread the word which itself delivered millions of impressions and got people down to the garden to take a look and learn a bit more about Marie Curie and the work they do.